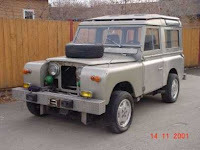 This is a 1959 Land Rover / Citroen / Nissan. Call this one Frankenrover. Essentially this is a Land Rover with a Citroen SM hyrdropneumatic suspension and a Nissan 300 ZX engine. The transmission, transfer case and front differential are from a Nissan Pathfinder. To make things a bit more confusing, the rear differential and inboard brakes are from a Jaguar. The seller also mentions that "the door latches are Mercedes with 69 grand prix handles on the outside" and that "there are other neat little parts from other cars", too. The eBay listing has some impressive photos, showing the steps taken in creating this thing. The body appears to be in decent shape, but missing the grill. That would be the least of your worries with a vehicle like this one. The under the hood photo shows some amazing engineering. Somehow, I have no idea how, he managed to get the turbo Nissan engine and the Citroen suspension spheres and plumbing to fit in the engine bay along with everything else that needs to be to be in there. It's not pretty, but apparently it works. The mess of wires going through the firewall (look in the upper right corner) looks a little scary and one has to wonder just what all those aftermarket relays do, but I have to assume all the Lucas electrics are gone, so no matter how scary all that stuff looks, it will most likely still work better than the original electrical system that came in this Land Rover. I'm really curious as to what the thought process was when dreaming up this vehicle. There is a certain amount of logic here, the Citroen suspension is an extremely sophisticated suspension and the 300 ZX engine is powerful and reliable, but putting the two together in an old Land Rover is just not something most people would think of doing. In fact, I'd bet it's not something anyone, but this person, has ever thought of doing. I'm not sure I like this Land Rover, I tend not to like cars that have been modified with parts from other brands of cars, but I admire the hell out of the work and engineering that went into this vehicle. Click here to check out the eBay listing. This would usually be the point where I'd refer you to a website that features cars similar to the one I'm posting. Of course in this case there isn't one. You're on your own. Unbelievable. It's gotta lose the Nissan wheels though. OK - We (especially me) may have been "taken" by this eBay listing. I checked the ad today to see if it was sold and the seller had added some pictures of the vehicle in its "current state". It ain't pretty, and looks nothing like the first few photos he posted. The "storage" he mentions in the ad appears to be outside, in the snow. The front sheetmetal doesn't seem to be attached to the car anymore and the interior is a mess. There is no way this LR could have been driven "25,000 miles" in the state it's in. What can I say? For every great eBay listing there seems to be one or two like this one.